A quilt can be any size. 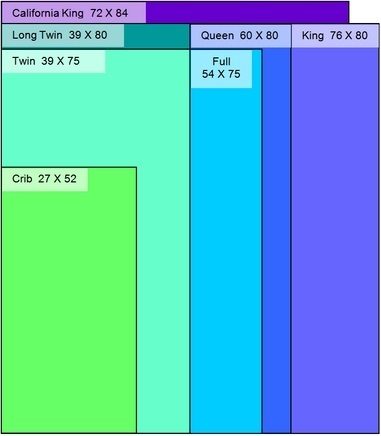 However, if you want to know how your quilt will fit a standard mattress or if you are planning a quilt to fit someone's bed, here are some measurements that may help. Drop is the amount that hangs over the edge of the mattress. Tuck is the amount that tucks under the pillow. The following measurements* are for comforters which usually have a short drop & tuck. If you are planning a quilt to be used as a bedspread with longer drops, you'll have to add more. All measurements are in inches.